Recent advances in high-performance computing (HPC) have promoted the creation of standardized remotely sensed products that map annual vegetation disturbance through two primary methods: (1) conventional approaches that integrate remote sensing-derived vegetation indices with field data and other data on disturbance events reported by public agencies on a year-to-year basis, and (2) “big” data approaches using HPC to automate algorithms and workflows across an entire time series. Given the recent proliferation of these annual products and their potential utility for understanding vegetation dynamics, it is important for product end users (that is, practitioners and researchers in domains other than remote sensing) to understand the differences in their representations of disturbance and the conditions under which they report it. We use fire in California as a case study to compare reported disturbance across three widely used vegetation disturbance products—LANDFIRE (representing the conventional approach), Hansen Global Forest Change (GFC), and North America Forest Dynamics (NAFD), the latter two created from automated approaches. Using Google’s Earth Engine, we compared their total and annual amounts of fire and non-fire disturbance for 2001–2010 and examined the products’ reported disturbance across different environmental and burn conditions. We found that GFC and NAFD reported similar amounts of disturbance that were consistently much lower than LANDFIRE’s reported disturbance across all years, regions, and habitats. We also found that despite the differences in amounts of reported disturbance, the products identified disturbance in similar ranges of bioclimatic conditions and habitat types, and thus, differing environmental conditions in areas reported as disturbed were not the drivers of the difference. Rather, we found that lower sensitivity to fire disturbance for GFC and NAFD, as compared to LANDFIRE, was a key driver of the overall differences in the amounts and locations of reported disturbance; both GFC and NAFD reported much lower amounts of fire disturbance than LANDFIRE across all burn conditions. Furthermore, the difference in reported disturbance between LANDFIRE and GFC/NAFD was greater for fire disturbance than for non-fire disturbance; LANDFIRE reported more than double the total amounts of fire disturbance of GFC and NAFD in the study period. Based on our results, we encourage end users to choose the appropriate disturbance product based not only on spatial extent and habitat but also on the disturbance type of interest (that is, fire and non-fire). Overall, rather than focusing on accuracy, our study quantifies the extent to which the products exhibited differences in the amounts and locations of reported disturbance to provide insight into these products’ representations of disturbance and help end users evaluate and choose the most appropriate product for their needs. Data hosted on Figshare at https://figshare.com/articles/Vegetation_Disturbance_Product_Comparison/7768586. JP and MK conceived of the work together. JP led the analysis and data curation; MK provided feedback on the analysis. JP wrote the original draft; MK provided review and editing throughout the process. The online version of this article ( https://doi.org/10.1007/s10021-019-00367-9) contains supplementary material, which is available to authorized users. The authors would like to thank the Geospatial Innovation Facility (GIF), Matthew Potts and Iryna Dronova at the University of California, Berkeley. FRAP. 2018. FRAP fire perimeters product metadata. http://frap.fire.ca.gov/data/frapgisdata-sw-fireperimeters_download. Last accessed 20 Nov 2018. Gorelick N, Hancher M, Dixon M, Ilyushchenko S, Thau D, Moore R. 2017. Google earth engine: planetary-scale geospatial analysis for everyone. Remote Sens Environ. http://www.sciencedirect.com/science/article/pii/S0034425717302900. Goward SN, Huang C, Zhao F, Schleeweis K, Rishmawi K, Lindsey M, Dungan JL, Michaelis A. 2016. NACP NAFD project: forest disturbance history from Landsat, 1986–2010. ORNL DAAC, Oak Ridge, Tennessee, USA. http://daac.ornl.gov/cgi-bin/dsviewer.pl?ds_id=1290. Last accessed 11 Feb 2017. Healey SP, Cohen WB, Yang Z, Kenneth Brewer C, Brooks EB, Gorelick N, Hernandez AJ, Huang C, Joseph Hughes M, Kennedy RE, Loveland TR, Moisen GG, Schroeder TA, Stehman SV, Vogelmann JE, Woodcock CE, Yang L, Zhu Z. 2017. Mapping forest change using stacked generalization: An ensemble approach. Remote Sens Environ. http://www.sciencedirect.com/science/article/pii/S0034425717304418. Hyde J, Strand EK, Hudak AT, Hamilton D. 2015. A case study comparison of landfire fuel loading and emissions generation on a mixed conifer forest in northern Idaho, USA. 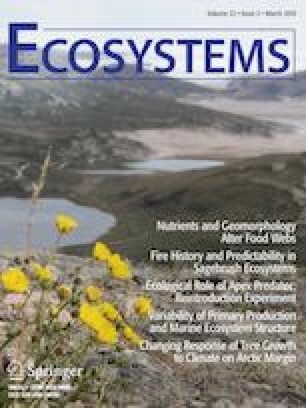 Fire Ecol 11. https://www.fs.fed.us/rm/pubs_journals/2015/rmrs_2015_hyde_j001.pdf. Kennedy RE, Yang Z, Cohen WB. 2010. Detecting trends in forest disturbance and recovery using yearly Landsat time series: 1. LandTrendr—temporal segmentation algorithms. Remote Sens Environ. http://www.sciencedirect.com/science/article/pii/S0034425710002245. LANDFIRE disturbance product metadata. https://landfire.cr.usgs.gov/distmeta/servlet/gov.usgs.edc.MetaBuilder?TYPE=HTML&DATASET=FA9. Last accessed 6 Jan 2017. LANDFIRE. 2018a. About web page. https://www.landfire.gov/about.php. Last accessed on 20 Nov 2018. LANDFIRE. 2018b. Guidelines for evaluating LANDFIRE fuel data. https://www.landfire.gov/documents/EvaluatingLANDFIREFuelsData.pdf. Last accessed on 20 Nov 2018. McKerrow A, Dewitz J, Long DG, Nelson K, Connot JA. 2016. A comparison of NLCD 2011 and LANDFIRE EVT 2010: regional and national summaries. https://pubs.er.usgs.gov/publication/70177839. Moritz MA, Stephens SL. 2008. Fire and sustainability: considerations for California’s altered future climate. Clim Change. http://www.springerlink.com/index/5411702235mx5432.pdf.